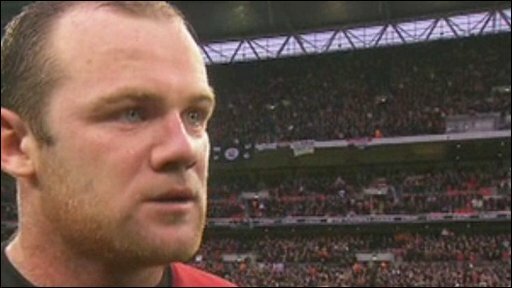 Manchester United striker Wayne Rooney was delighted with his match-winning heroics in the Carling Cup final. Rooney started the game on the bench but got an early call when Michael Owen was forced off with a hamstring injury. "It's a great feeling to play a final at Wembley and to score the winning goal is unbelievable," he said. "Obviously I wanted to play but I had a bit of a sore knee. Fortunately for me I came on and I'm delighted with the winning goal." After United's 2-1 win over Aston Villa, manager Sir Alex Ferguson revealed he knew weeks ago that Rooney would not be starting the Wembley showpiece, having decided to pair Dimitar Berbatov and Michael Owen in attack. Rooney came on in the 42nd minute and scored 32 minutes later - looping a header past Brad Friedel to help United retain the trophy. "I was chomping at the bit to get on," Rooney added. "You want to play in finals. Thankfully I have managed to do so and left my mark on the game. "I knew on Wednesday or Thursday I wouldn't be playing. I had a little bit of a stomach bug and the manager was looking for an excuse to leave me out. "When he found out about that it made his mind up. I was still disappointed but it was the correct decision by the manager." Nevertheless, Rooney looks increasingly unlikely to start for England in their friendly against Egypt on Wednesday. Despite the threat of injury or burn-out, Rooney is keen to play as much as he can as he edges closer to the goalscoring mark of ex-United star Cristiano Ronaldo two seasons ago. "I am enjoying playing at the minute and enjoying scoring goals," said Rooney, whose Wembley winner was his 28th for the club this season. "Hopefully that will continue. "Cristiano got 42 but I am just looking to contribute to us winning medals. If that happens it would be great but as long as we win medals it would be even better." Villa boss Martin O'Neill saluted Rooney, who also hit the post with another header, saying: "He's a world-class player and arguably in the top three players in the world. It only made it more exciting when he came on." In contrast, Owen is set for a spell on the sidelines after pulling up with hamstring trouble trying to run through on the Villa goal. Ferguson took responsibility for the striker being forced off before the interval. He said: "He (Owen) did really well for us and it was a good performance from him. It's maybe our fault too. He's not had a lot of minutes recently and that soft pitch didn't help him. It's a bad blow for us." Owen admitted his day had been soured by his failure to see out the 90 minutes, but he was delighted to score. "It's unfortunate, it's a great to win and score and play a part. Hopefully it will not take too long to recover. "It's the first injury [since joining United] but it's been a great day. This team has done fantastically well and it's my third League Cup." 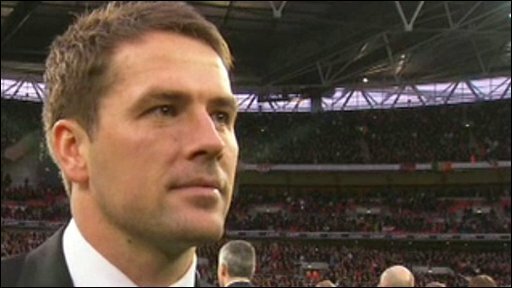 Owen shrugged off continued talk about an England recall after scoring in front of national coach Fabio Capello. "I don't think about it to be honest," he added. "A lot of people have been getting their knickers in twist - I just want to play well for Manchester United and if that gets me recognition then great."